This is the sandwich to beat them all. 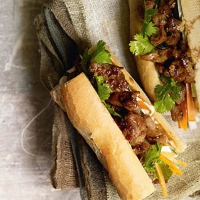 The airy, crisp-shelled baguettes in Vietnam are made with rice flour – but a very fresh wheat-flour loaf will do nicely. Make the pickle. Mix 90g sugar and the vinegar with 100ml water and a pinch of salt in a bowl, stirring until the sugar dissolves. Add the vegetable matchsticks and set aside for 2 hours. Mix the pork with the chillies, garlic and lemon grass. Set aside for 30 minutes, if you have the time. Season the pork lightly and place a large wok or frying plan over a high heat. Add the oil and sauté the pork for a couple of minutes. Then add the fish sauce and the remaining sugar (stand back and turn on the fans) and continue to stir-fry until the pork is glazed and caramelised. Remove from the heat. Cut each baguette in half and split the pieces open. Brush the insides with a little soy sauce and spread with mayonnaise and slices of cucumber. Now stuff in some pork, a couple of sprigs of coriander and the pickles. Drizzle with any juices from the pork.